The HP LaserJet Enterprise 700 MFP M725z plus is a monochrome laser printer with a print, scan, fax and copier function. This printer would suit a small business or office that carries out a high volume of monochrome printing up to A3 size. The large paper and ink capacity ensures printer disruption is kept to a minimum. With its Energy Star certification, considerable costs are saved over the lifetime of the printer, and the environment is protected. The HP M725z+ produces good-quality results, but it is necessary to carefully consider all printing needs before purchasing this model, which prints in monochrome only. Colour printing would require purchasing another device. The HP M725z+ measures 745 x 681 x 1192mm and comes in a grey design that blends well with most colour schemes. Users navigate the printer and manage printing tasks using the eight-inch display screen. Connection is achieved via Ethernet, USB or Wi-Fi. A side door gives easy access to the print cartridge. The printing speed is 40ppm, the printing resolution is 1200 x 1200dpi and the monthly duty cycle is 200,000 impressions. 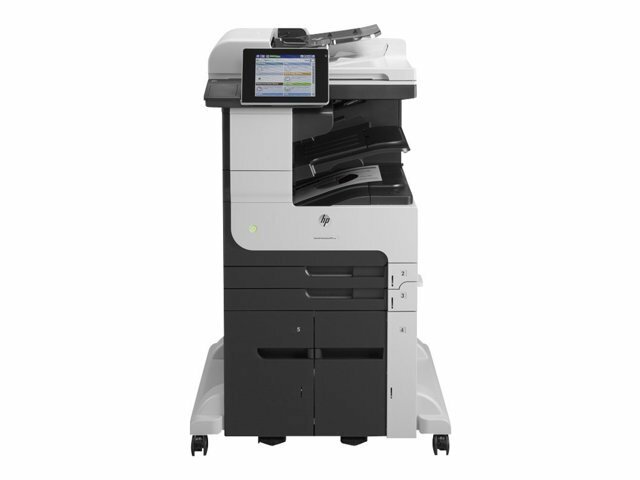 With up to A3 size printing, the HP LaserJet Enterprise 700 MFP M725z plus fulfils a wide range of printing needs. The sizeable paper and ink capacity reduces the disruption of printing operations. The machine prints from smart devices and a variety of commonly used office devices, and it has a built-in stapler. Integrated management and security features ensure the smooth, secure operation of printing tasks, while energy-saving features help keep running costs down. The HP LaserJet Enterprise M725z plus prints in monochrome only, so if colour printing is required, this is unlikely to be the best option in terms of both money and space. Additional paper trays will need to be purchased to achieve maximum paper storage.